Legends and Liars - Audiobook | Listen Instantly! The second novel in the fast-paced new adventure fantasy series, the Duelists trilogy, in the vein of Michael J. Sullivan and Scott Lynch. Vocho and Kacha are brother and sister, and between them they’ve got quite a reputation. They were once known for the finest swordplay in the city of Reyes. The only problem is, ever since they were thrown out of the Duelist’s Guild for accidentally killing a man they were sworn to protect, it seems everyone wants them dead, including a dark magician whose plans they recently thwarted. Now Vocho and Kacha are in the midst of an uneasy truce, not sure whether to trust each other or anyone else for that matter. What’s more, the sinister magician is rumored to have returned. Now that he knows who was behind the failure of his last plan, he’s determined to put a stop to Vocho and Kacha permanently. And this time, the flash of steel may not be enough to save them. 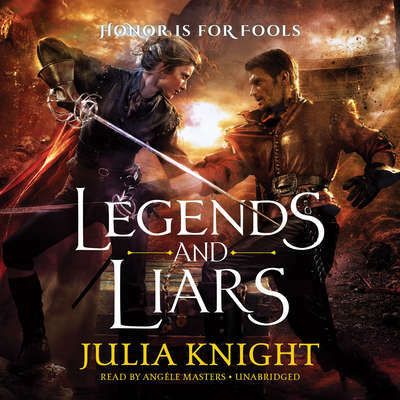 Julia Knight is married with two children and lives with the world’s daftest dog, who is shamelessly ruled by the writer’s three obligatory cats. She lives in Sussex, England, and when not writing she likes motorbikes, watching wrestling or rugby, and killing pixels in MMOs. She is incapable of being serious for more than five minutes in a row.